The intention of walking meditation is to purposely focus on walking; to use each step as a way of bringing the mind into the present and centering attention and awareness. Historically, walking meditation was done barefoot, without shoes, or socks for that matter. And that’s still applicable if you’re walking on the grass in your garden or perhaps on the beach. But let’s face it; it’s pretty dangerous to go walking down the street in the urban metropolis without shoes on. Not to mention that the meditative experience would be somewhat disrupted by nagging thoughts of stepping on sharp objects and who knows what else! That said, I don’t know about you, but I love walking barefoot, and take every opportunity to do so when I’m outside of the concrete jungle – particularly at the beach or in the park in the summer. It’s such an amazing experience to set your feet free from the constraints of shoes, to connect the sensory points of the feet to the ground and allow Mother Nature to massage your toes as you put skin to ground. But under most circumstances it isn’t very practical, and there are few places one can safely walk barefoot these days. You may have heard of the “barefoot running” craze that has become increasingly popular in the last few years. Some people do actually run barefoot in the most naked sense, but most use special footwear that emulates the experience of being barefoot by aligning the body with the way humans were intended to walk/run. In a nutshell, barefoot footwear is kinder to your feet, betters your posture and brings a whole new sensory experience to walking and running. 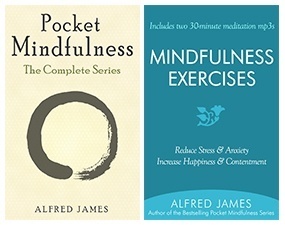 If mindfulness were a shoe, it would be a barefoot shoe, I’m sure. It’s also worth mentioning that the Vivo brand of shoe I bought is vegan-friendly: They are largely hand-made and contain no animal by-products. Vivo break their footwear down into 3 core categories: on-road, off-road and amphibious. Each category is designed for the stated purpose using variations of sole-thickness, compound and style. 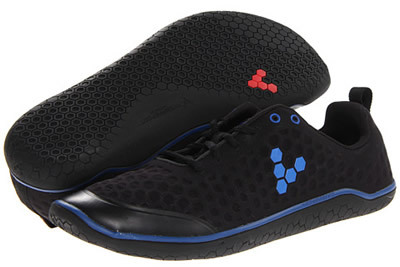 I have an on-road pair called Vivobarefoot Stealth (that's them in the picture above). These are specially tuned for the road and treadmill using flexible, soft and wet/dry slip resistant sole that lets your foot “do its thing”. The off road versions are for muddy trails, hiking and golf, and the amphibious versions are for light trails, beach runs and water sports. 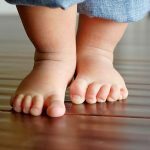 So what’s different about the walking experience when using barefoot shoes? — Your muscles and ligaments act as natural shock absorbers, as they’re supposed to. This means walking becomes a healthy mini-workout. Believe it or not, all that fancy cushioning we've gotten use to is bad for your feet. — Your feet are given total flexibility to allow the big toe to engage rapidly for independent rear and fore-foot movement. This means you finally start walking properly, which is healthy news for your posture and skeletal structure. — There’s no artificial support or shaping to dictate how your walk. Instead, the anatomic width allows your natural arch and toes to load, splay and recoil. This means you’re in control. You can better grip the floor and feel more assertive and confident as you literally float along. — The ultra-thin sole allows the body's nervous system and 200,000 receptors in the soles of the feet to provide natural sensory feedback. This means you feel an overwhelming primal connection with the earth. It’s an amazing experience, albeit a little scary in the beginning because for the first time you are feeling everything underfoot. But don’t worry, the soles are super-tough and puncture resistant: I’ve been trekking all over the park and through town and haven't noticed any wear and tear thus far. Those who already have barefoot shoes will know why the experience has excited me and compelled me to share. It’s a real buzz. It feels like a new experience but at the same time very innate and normal. After about 20 minutes, you’ll begin to notice that you’re walking differently. The shoes naturally encourage you to walk properly; to shift your weight from heel to big toe with a smooth heel in a relaxed, balanced and symmetrical rhythm. Unless you were brought up in an unshod, chair-free environment, you are likely to be lacking in certain physiological qualities and biomotor skills for natural human movement. My Vivos have really enhanced my walking meditation and made it that much closer to walking barefooted. I love that I can feel the terrain rolling across my sole, and that my entire foot, calves and muscles, all the way up to the bottom of my back, feel engaged in the process. It's an altogether primal walking experience. The one issue with my Stealths is that the hexagonal mesh isn’t waterproof, so rainy days are currently off limits. I am going to save up for an amphibious pair though. My wife has also requested a pair of marine blue Stealths – that's her birthday present sorted! One piece of advice before I sign off: I’ve compared my experience with a few friends who have barefoot shoes/trainers and it seems the adaptation process varies from person to person. I felt fully comfortable very quickly because I transitioned from canvas-type shoes that are pretty thin-soled. 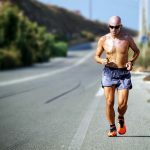 But if you’re coming from shoes/trainers that are heavily artificial cushioned, you will really feel the impact and may take a few days to get into the swing. It’s totally worth it though, and really will change your life. I can’t wait to put mine on again. They are making me walk more and doing my health a favour in the process. 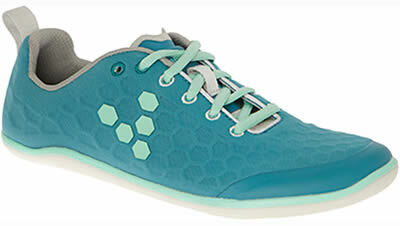 You can read more about Vivobarefoot footwear here on their website. You can also check out competitive pricing on Amazon.com. I’d love to hear the experiences of others who’ve gone barefoot, so be sure to leave your comments below. **For the record, I have no affiliation with Vivo. I simply love the shoes I bought and wanted to share with you the reasons they have enhanced my walking meditation experience.